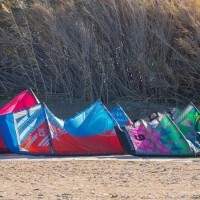 1 week kite camp for those who want to boost their Skillz. For this course no experience needed. For this course you must have completed the full beginners course . Style improve, first jumping, first tricks. Basic strapless riding changing foots, gybe, tack. 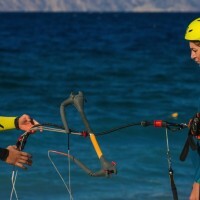 Complete kite gear rental for 6 days, with the option of change according the wind conditions and needs. 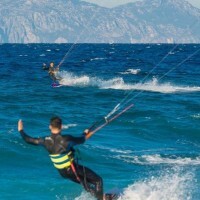 1 Week kite camp for beginners with full program. 1 Week kite camp for those who don't need lessons or equipment. Just to stay right on the spot and store their stuff. Learn to fly in the island of sun. 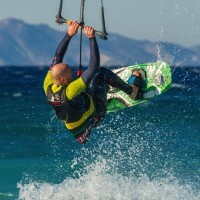 Rhodes island is one of the best kitesurfing destinations of Europe. That’s why we opened our kite school here. The near constant wind, warm and safe waters, beautiful beaches and amazing climate of this island have made it famous for wind and water sports. These same things mean it’s the ideal place to learn how to kite surf. 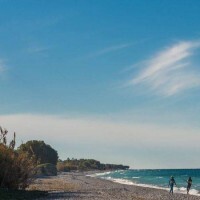 Our kite station and the guest house share the same area, where the waters and meltemi winds await you just outside our front door in Tholaros beach located just 5 min away from airport, Theologos village and 20 min from Rhodes town. Instructors from all over Europe with IKO certification cover several languages, so kiters from everywhere can feel comfortable. Your kitesurf experience starts here. 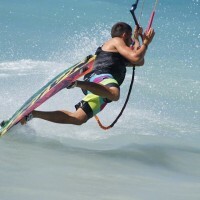 If you are an experienced kitesurfer or want to begin your journey in our world you came to the right spot. We offer full packages with lessons, accomodation and transfer.